I fitted so much stuff in there, you wouldn’t believe! And it makes a great footstool/extra seat/storage for off-season blankets, extra pillows, whatever. You could stash extra bedding in it for your guest room. Yarn stash! Christmas cushions! You name it. Because I started out using up older random yarn (including frogged yarn from a cardigan) and ended up using some nicer stuff (Willow Wash in my two favourite colours and some Red Heart With Love variegated) I actually prefer the colours in the bottom part which will be hidden while in use. And now it’s late and I really do need my beauty sleep! It occurs to me it would be good for storing spare pillows too. I might have to stuff some in as well as the blankets to get it nice and firm. I will do some decrease rounds next. The pattern just says to do one decrease round and then make a drawstring. But I’d rather reduce my stitch count first. It’s a beautiful sunny Sunday and I must get out and walk today. I was hoping for at least some sunbathing yesterday but instead Tai Chi Man and I cleaned out the cold room, tidying, vacuuming, relabelling the storage containers, and then I had to make dinner for all five of us (ds1 came over). Today is May 1st, a new month and a new motivation for raw foods. Tai Chi Man and I plan to eat raw for the month of May. I am hoping to see increased energy, joints feeling young again, clothes fitting a little looser. I have my holiday in June visiting family as extra incentive. The beauty of having a Ravelry queue is that if you ever run out of inspiration for your next project you just visit your queue and see what you added to the list of potential projects. I do keep it fairly controlled – I know some people have thousands of things in their queues – but mine is only five pages long and periodically I will weed the list so it doesn’t get out of hand. This morning, I noticed the Hanging Basket pattern, which is not in English on the blog but is written out in full on the Ravelry project page. 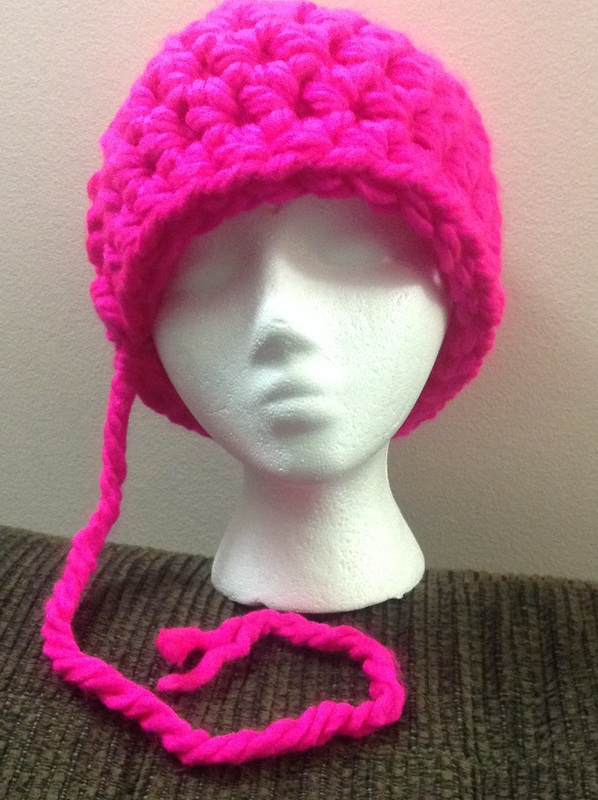 It’s very simple and with multiple strands of yarn, or one strand of a super bulky, it’s really fast. I started it while waiting for ds2 to get ready to go snowboarding. The drive is about an hour, and I managed to get a lot done despite being squished in the back seat with a man-sized son on one side and a snowboard on the other (we only have a small car, so we have to fold down part of the back seat). Tai Chi Man and ds1 were in the front. Son number three once again didn’t bother to go. That was his last chance for this winter. Conditions were perfect, with the temperature at the village elevation being around zero, and the snow was not too icy so there was plenty for the board to carve into. I fell down a few times as usual, and I’m sure I’ll feel the full extent of my sore bits when I try to get out of bed in the morning! I quit the slopes before the men, so enjoyed some more crochet time in the lodge. And the basket was finished! It’s a good size but I haven’t decided where to hang it yet. I used two strands of worsted and three of DK and a 10mm hook. It would be fun to play with the pattern and make different sized ones. So that was my day. Work tomorrow but thankfully not Sunday (it’s one of the three days per year that the store closes). What do you do with a home day? I have to confess that one of my favourite emails to receive is the Google Calendar notification that tells me, “You have no events scheduled for today.” But as you can see, I’m not doing nothing! Have to work today, so just posting a few updated photos of the rug, which as you can see has grown fast. Goal is to make it 48″ long. A nighttime shot, closeup, and daytime shot – 40% finished.